As well as the traditional New Year's price hikes, UK rail commuters face an additional humiliation – data speeds aren't increasing as fast as they might. RootMetrics issued a comparative performance of how much of a rail journey can access 4G data for the duration of the journey. 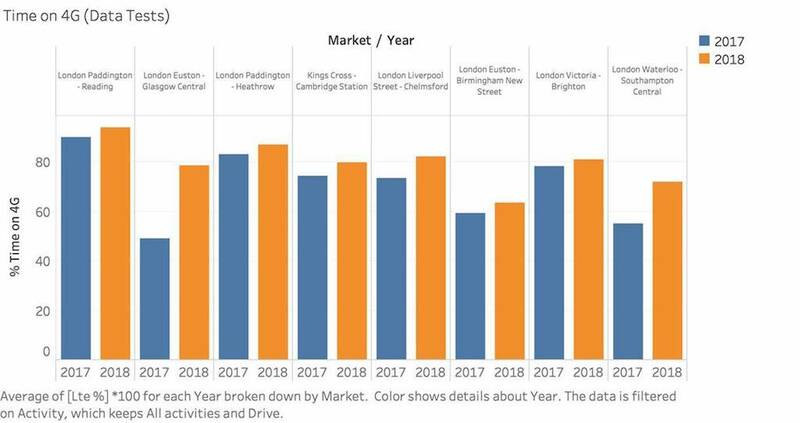 Apart from the West Coast Main Line, there was barely any improvement in 2018. Commuters on the London-Glasgow journey benefited from LTE upgrades along the line. In 2017 a full-journey passenger between the two cities could attach to 4G for about half of the journey time. In 2018, they could for almost 80 per cent of the time. The story isn't as happy on other lines surveyed by RootMetrics, though. Passengers on the London-Birmingham route can expect to fall back to 3G or lower for at least a third of the journey. The problem is, while LTE has excellent population coverage, a train passes through many areas where there isn't much population. The latest annual National Rail Passenger Survey did find an increase in satisfaction with onboard internet performance – just a very small one (PDF). Four per cent reported themselves happier with onboard internet performance overall. However, internet reliability ranks lowest of all the 23 categories in which passengers are quizzed about train facilities. Altogether 39 per cent of long-distance passengers said they were satisfied with reliability of the internet and only 34 per cent on regional services. On Virgin Trains, it's 40 per cent. The onboard Wi-Fi relies wholly or partly on the national operators' coverage – Virgin Trains explained that it uses a satellite link too. So in practice, performance is only as good as the cellular coverage. But upgrading this is a scrap between the train operators like Virgin and Network Rail. In 2014, the government pledged cash to upgrade the experience for consumers – and even more in 2017, financed from fines on operators for poor performance. Whitehall bean-counters have traditionally regarded time spent travelling as wasted when calculating the costs and benefits of infrastructure. But thanks to mobile communications, a train seat becomes an office. In fact, it makes more sense to have a slower journey with fewer changes if the workload needs a good internet connection (HS2, for example, shaves a few minutes off a journey, but requires more awkward connections at London and Birmingham).